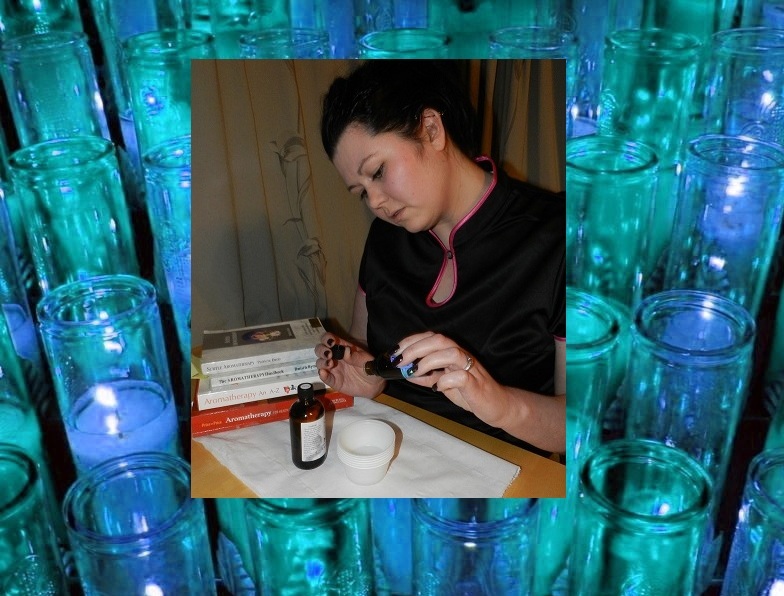 As a Complementary Therapist one of the main areas I enjoy is using essential oils to treat the skin. It usually takes around 3-4 weeks to feel the benefits of Aromatherapy especially if a particular condition is being treated. It’s worth remembering that Aromatherapy treatments are not to be used in place of medication – essential oils can be dangerous and I do not recommend blending them yourself. Properly used essential oils are very safe but some oils are hazardous and can build up to a toxic level in the body over time. Some oils are poisonous and deaths from essential oil poisoning have been reported. A full consultation should be done before any oils are used to ensure that you do not have any contraindications to treatment (some oils cannot be used on certain people). If a therapist does not perform a full consultation asking questions about your lifestyle and medical history I suggest you find someone else to perform the treatment. I’m not a skin specialist and any treatment I provide is based on the training I have undertaken in my Complementary Therapy degree and various other courses I have completed, as well as the information provided to me by my clients. Aromatherapy is a holistic therapy and we treat the person as a whole rather than an individual symptom, meaning we concentrate on all issues not just one particular area. By doing this we can often treat one problem that has been leading to another. I would like to focus on sensitive skin during this blog post which the majority of my clients, including myself, suffer from. Sensitive skin is easily irritated and thinner than other types, due to the nerve endings and blood vessels being closer to the skin’s surface. Sensitive skin is most likely to react adversely to essential oils. The three main causes of sensitive skin are stress, environmental factors and hormonal activity. Stress related sensitive skin is sensitive to emotional turmoil and worsened by stress. Essential oils that treat any stress the client is facing should be used; these include Lavender, Roman Chamomile, Rose, Geranium and Ylang Ylang. Skin that is sensitive to environmental factors tends to develop allergic reactions to beauty products, cleaning products or food. This type of person will be sensitive to essential oils and gentle oils should be used such as Geranium, Jasmine and Roman Chamomile. A patch test should be done before using Rose, Sandalwood, Cedarwood and Ylang Ylang. Hormonal sensitive skin tends to break out before menstrual periods and can be made worse by steroid drugs. Hormonal activity regulating oils should be used such as Jasmine, Geranium, Fennel, Clary Sage, Orange, Neroli, Sandalwood, Patchouli, Chamomile and Lavender. As a base oil I like to use either Evening Primrose, as it can help with allergic skin reactions, or Sweet Almond as it helps to soften, nourish and revitalise the skin. Lavender is my all time favourite essential oil; it’s versatile and has so many amazing properties. Lavender can help with skin healing, pain relief and is an antiseptic. Many people can’t stand the smell of Lavender, but I assure you it’s really worth using it as part of a blend. Quite often depending on the symptoms being treated the Lavender scent is disguised by the other oils.